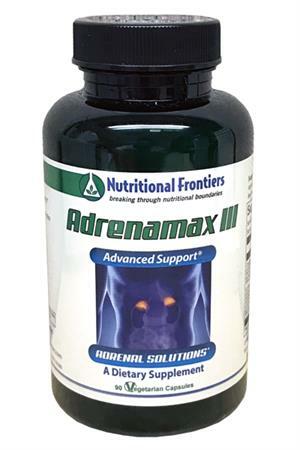 AdrenaMax III by Nutritional Frontiers promotes resilience to stress by supporting the function of the adrenal glands. The herbs in Adrenamax III have traditionally been used to help with both hyper-function and hypo-function of the adrenal glands, hence they are classified as ‘adaptogens. • Cordyceps Mycelium Extract is a medicinal mushroom popular in China and Tibet. Herbalists recommend cordyceps to improve energy, sexual function, athletic performance, and immune function. • Panax ginseng is also called Chinese ginseng or Asian ginseng, and has been in use since at least the 1st century C.E. Its many constituents, such as ginsenosides and panaxans, contribute to systemic effects such as supporting immune function, lowering blood sugar, improving libido and erectile dysfunction, increasing sperm count, and enhancing physical and intellectual performance. • Eleutherococcus senticosus has a variety of applications in the body, such as improving attention, mood, and stress tolerance. People who are debilitated from cancer, chemotherapy, cardiovascular disease, or other chronic health conditions may benefit from this root. Also known as Siberian ginseng, this has been used by herbalists from many countries for at least 2000 years. Eleuthero is stimulating and warming. • Ashwagandha (Withania somnifera) root is native to Sri Lanka, India, Africa, and Pakistan. A relaxing adaptogen and tonic, this plant is useful for ‘building up’ people who are debilitated from long term stress. Ashwagandha helps in both acute and chronic stress conditions as well as those struggling with insomnia, inflammatory diseases, and anxiety. • Rhodiola rosea root has been used in Siberia, other parts of the former Soviet Union, Scandinavia, Germany, and other European countries as an adrenal adaptogen with actions similar to Siberian ginseng. Rhodiola may help endurance, cognitive function, immune function, weight loss, athletic performance, and energy levels. • Glycyrrhiza glabra is commonly known as licorice, a plant with a variety of actions in the body. Glycyrrhiza assists with recovery from long term stress by increasing the half life of cortisol. Licorice blocks leukotrienes and therefore possesses anti-inflammatory capabilities. Glycyrrhiza is often used as a demulcent to heal the digestive tract and as an anti-viral and antioxidant. Those with high blood pressure must use caution when ingesting licorice, as it may worsen hypertension in some people. Suggested Use: As a dietary supplement, take 3 capsules, 1-2 times daily, or as directed by your healthcare practitioner.